For those who love the appearing of the Lord, this triple charm pendant says it all: the cross a symbol of His sacrifice, the heart a symbol of His love, and the anchor, a symbol of hope. Each delightful charm measures approximately 10mm and together makes a grand statement of your faith. If you’re looking for a lovely Valentine’s Day gift for someone you love, consider this pendant and include a 14k gold box chain in 18″ or 20″ (optional) to make it an instant necklace. If she has a favorite chain already, she may elect to add this meaningful pendant to a chain with history or sentimental value. Either way, she’ll love this expression of her faith! 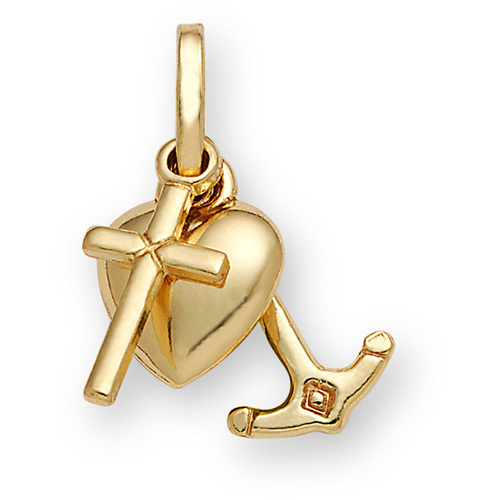 Part of our beautiful collection of 14k Gold Charms. God declares that your name is inscribed upon the palms of His hands as a continual reminder that you belong to Him. 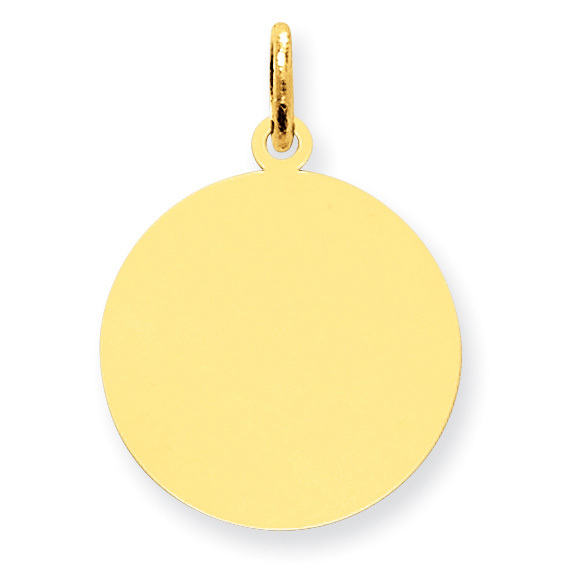 With this plain, round, 14k yellow gold disk, you can engrave a favorite Scripture or the name of the one you love and delight her on Valentine’s Day! Our round disc is perfect to wear as a necklace or as a charm, and you can engrave the front, the back, or both (up to 3 lines per side). Now is the perfect time to order this thoughtful charm to have it in time for Valentine’s Day (engraving adds an additional 3-4 days to shipping time). To make it an instant necklace, add one of our 14k gold box chains or attach it to one of our Gold Charm Bracelets. Available in a variety of sizes. Valentine’s Day wouldn’t be complete without giving someone special a heart. Though paper ones, especially made with your own hands, are beautiful and sentimental, they don’t begin to compare to our captivating puffy heart charm in 14k yellow gold! This engaging symbol of love is rounded to appear puffy, sure to please the girl or woman you adore. This three-dimensional heart has been polished to a high shine, giving the yellow gold from which it’s crafted an irresistible warm glow. Purchase one of our Gold Pendant Chains and present it as a charming necklace (please excuse the pun!) or start a charm bracelet for her with this one being the first and most important charm on it. 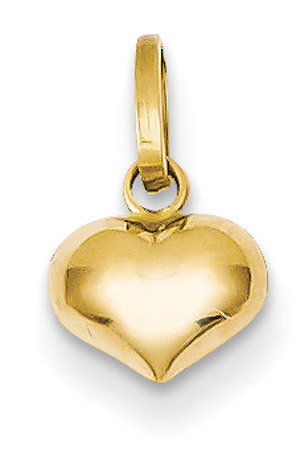 Whether it stands alone or shines with a collection of other charms, this 14K gold small puffed heart charm communicates a message of affection in sweet, sophisticated fashion. It measures approximately 1/4″ in size, the perfect little heart to be treasured for years to come. Nothing quite amazes me like knowing that not only did God put each star in its allotted place but that He also named them and remembers every name. There are approximately 1,000,000,000,000,000,000,000 (that’s 1 billion trillion) stars in the observable universe! Only God Himself knows exactly how many there are. 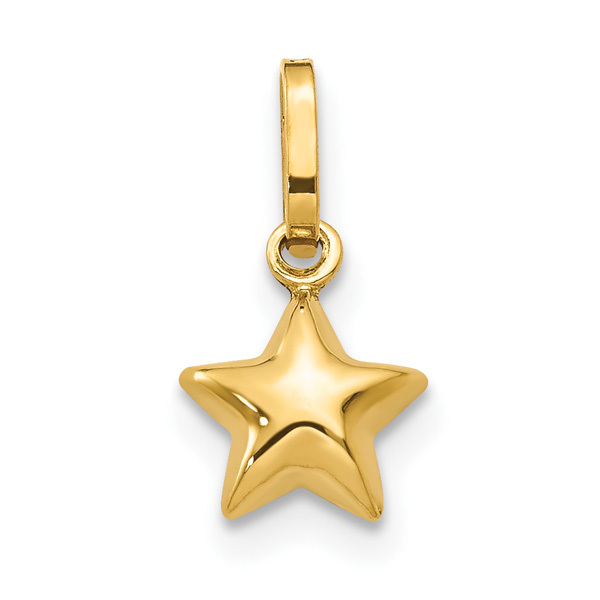 We searched the world over to find this extraordinary 14k gold star charm from Italy which would make some lovely lady or beloved daughter a remarkable gift on Valentine’s Day. The smooth shape of the five-pointed star is three-dimensional, looking for all the world like it’s been “puffed.” At 1/4″, it would make an endearing addition to a pretty charm bracelet or could be the first one added to one of our charm bracelets. Want to wear it alone? The addition of a 14k gold box chain will create an enchanting necklace. You could even attach it to one of our Gold Anklets to design a one-of-a-kind gift she’ll never forget. You still have time to give her the stars you’ll see shining in her eyes on this Valentine’s Day!